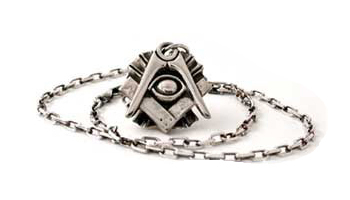 "I find nothing but the jewel of his office..."
The Original Mason's Jewel is consciously designed to be minimalistic, yet bold, something possibly seen on a Freemason travelling from Cathedral to Cathedral in the 1500's. 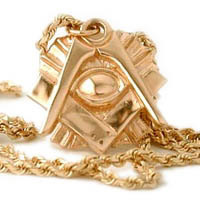 Primitive, yet effective composition showing the "All Seeing Eye of God" set in the center of the Square and Compasses. The Compass (above) teaches us to act within our bounds and limits, upon our own inner circle, and represents the spiritual world or world of an ethereal nature. . The Square teaches us to deal uprightly with others and represents the physical world of being, the reality we see every day. The blending of the two in perfect balance and harmony results in the blazing glory of God, and is the continued quest of the contemplative Mason. 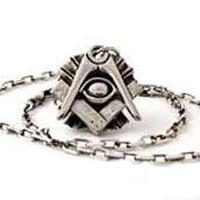 Masculine, heavy, and almost clunky, the Original Mason's Jewel is designed for the regular master mason to wear daily or on the outside of a Tuxedo. 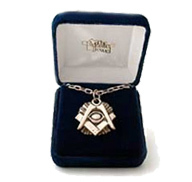 The name of the jewel, and also the name of this company, is inspired by that fateful second section of the third degree, where one sign of a Mason is "The Master's Jewel". Currently 66 guest(s) and 0 member(s) online.